If you can get past the stinky smell, nature's ancient witch hazel, makes a very nice astringent or toner for the skin. scientific names: Hamamelis viginiana ? Witch hazel is a deciduous bush or small tree that is found throughout most of North America. It has broad, toothed oval leaves, and golden yellow flowers. Brown fruit capsules appear after the flowers. The dried leaves, bark, and twigs are used medicinally. Witch hazel water is the most commonly found commercial preparation, usually kept in most homes as a topical cooling agent or astringent. Most people use witch hazel after facial cleansing. All you need to do is rub a cotton ball of witch hazel over your face, and enjoy a cool breeze. It is soothing and kind to sensitive skin. It relieves redness and swelling. And something in it, delivers back smooth, clear skin. Many acne sufferers have tried witch hazel after their complexions refused to respond to expensive prescription acne drugs and over-the-counter blemish-free products. And the results have been excellent. 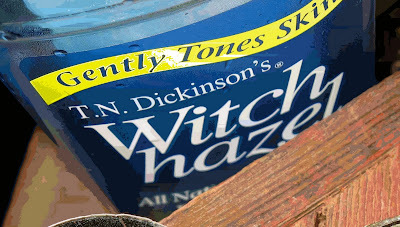 Dickinson's has been selling witch hazel since 1866. And the company boasts that their product offers "exceptional cleansing, soothing, and healing properties" as an herbal extract. And the stuff is economical. For under $5, you can get a 16 oz. bottle. Just hold your nose. The smell isn't pretty. Your right. The smell is soooooooo nasty. I cant get past the odor so I have a bottler sitting in my medicine cabinet hardly used. For a wonderful smelling, cruelty-free witch hazel try Thayers brand...it comes in Rose...Lavender...Peach...or Lemon.